Our new range of slimline freestanding displays are literally unmissable. Elegant design and bright, punchy, high-definition graphics are sure to get your message noticed. Make no mistake, these displays are nothing like a domestic TV screen! The bright commercial- grade display panels are designed for 24/7 operation. A shatter-proof glass fascia protects the screen surface from sticky fingers and more serious damage, while the button-free surround ensures no-one can change the settings. All models have a built in media player and a lockable compartment to hold a signage player, DVD player, TV tuner, etc. All models can now be specified with optional cloud-based content management, so you can manage your content from anywhere using LAN, WiFi or even 3G technology. Available to buy or to hire for short-term requirements, eg exhibitions, product launches and promotions. 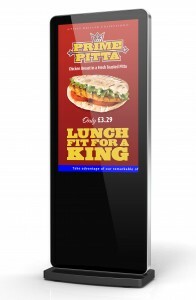 For further information or to order your slimline freestanding displays, contact AMT Media here.